You know the good old times are back when all your favourite childhood things like Nokia and Nintendo are back with their new products. And the latest artifact of the nostalgia is Nokia 3, which was announced at the recent Mobile World Congress 2017. The Finnish mobile maker Nokia joined hands with another Finnish company HMD Global to bring back the pioneers of the last decade. The company announced at the MWC 2017 that it is releasing Nokia 3, Nokia 5, Nokia 6 and the good-old Nokia 3310 soon. The Nokia 3 release date in India is yet to be confirmed. The Nokia 3 comes with the MediaTek MT6737 quad-core processor with 1.3GHz frequency and Cortex A53 64-bit architecture. The phone runs on the latest version of Android i.e., v7.0 (Nougat). Nokia 3 comes with an 8MP front and an 8MP rear camera, with 2.0F aperture, LED flash, and image resolution of 3264x2448. The camera features include exposure compensation, ISO control, Continuous Shooting, HDR, auto flash, Face detection, and touch to focus. The video recording ability can go up to 1920x1080 at 30fps. The aluminium-built Nokia 3 comes in four colors, which are Tempered Blue, Silver, Matte Black, and Copper. The Nokia 3 comes with a 5-inch IPS LCD display is with Corning Gorilla glass and the screen resolution of 720x1280p. The pixel density of the capacitative multi-touch screen is 294 ppi and the screen to body percentage is 67.16%. The additional features of Nokia 3 include Light sensor, Proximity sensor, Accelerometer, Compass, and Gyroscope. At the price range of Rs 10000, Nokia 3 is inarguably the best option one can have. Yes, there are other choices like the ever-in-demand Redmi 3S Prime, but when it comes to the brand value and the nostalgia, nothing can beat Nokia 3. 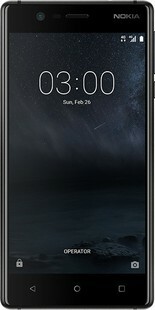 Nokia 3 full specs and reviews as of Apr 2019. Buy it here!